Seeds of Change: The Legacy of Father Kino is currently out of print. Explore the life and times of one of our region's most influential historic figures, Father Eusebio Kino. 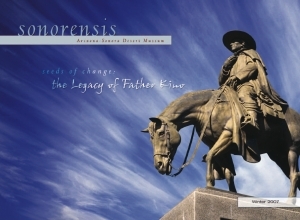 In this 2007 issue of our Sonorensis magazine, authors from Arizona, Mexico, Italy and Spain take you back to the late seventeenth century to illuminate the secular legacy of Kino as scientist, agronomist, diplomat and cartographer. Sonorensis is published as a benefit to the Arizona-Sonora Desert Museum membership. It is intended to further our members' understanding of the desert and shape their sense of stewardship. Visit our membership page to become a member and receive the next issue of this annual publication in the mail.